The Stat’s back and this time he’s baring his soulful, sensitive side amidst the usual skull-cracking. 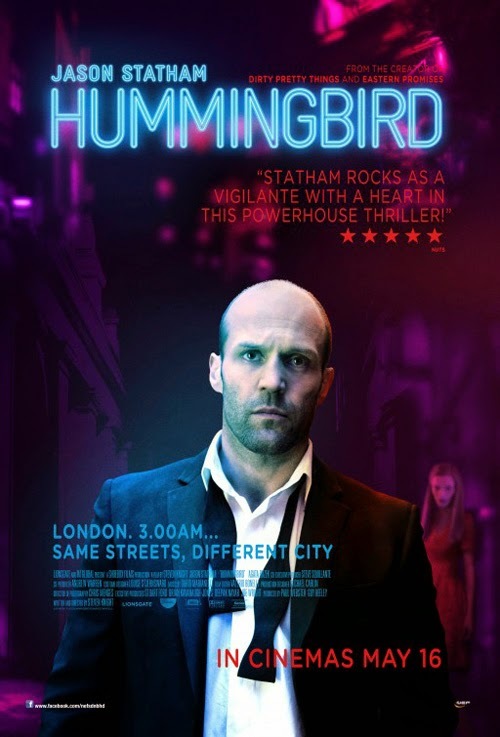 Steven Knight, a talented writer whose early credits on The Detectives shouldn’t necessarily be held against him, makes his directorial debut (as many dissatisfied writers are wont to do eventually) on Hummingbird, and it’s a mixed bag. Knight seems to be fully engaging with his archetypes, but does so to the point that his tale is doused in clichés. Material so self-consciously heightened requires a director and stars who can make a virtue out of the excesses; that everyone here is merely competent lays bare the overwrought corniness at its core. Alternatively, perhaps Knight has just been lucky that the likes of David Cronenberg (Eastern Promises) and Stephen Frears (Dirty Pretty Things) have shepherded his previous London-set thrillers to the screen. Promises has a number of things in common with Hummingbird, not least the strong silent man of idiosyncratic morals working for the mob and on a mission that requires him to weave a path through the corrupt underbelly of the city. But Eastern Promises etched out a genuinely tense and dangerous scenario, and one with twists in its tail. What you see is what you get with Hummingbird; Stat comes on the balding hairy homeless man before transforming into the shiny bald bruising machine we all love. He’s tortured, drowning his sorrows and PTSD in drink; the picture provides an over-explanatory flash back to the root of Stat’s “Joey Jones” current problems but Knight’s choices of military service (Afghanistan) and drone strikes feels manipulative and cynical. And worse, crushingly obvious. At least the era of haunted ‘Nam vet had some resonance (until Stallone showed up to take part). Movies appropriating the Middle Eastern conflicts seem to be united in portraying (heroically) troubled ex-soldiers, fully ripped, who slot into a all-purpose action roles. There’s even the gall to claim “commentary” in the depiction, which rarely amounts to more than an “Isn’t it awful? Now let’s get to the action bit”. So the Stat is a wanted man, and haunted by what he done (“They put me up a mountain and told me to kill people. What did they think would come back down the mountain” he impressively soliloquises). Really, there’s little difference between this and the average Stat movie; it just has a few pretensions (I was going to say “more pretensions” but Revolver’s about the only one that could also apply to). I prefer the literal UK title (Hummingbird; at one point Joey hallucinates a flock of the birds, a nice little moment that unfortunately descends into your rote flashback/trippy sequence) than the dead horse-floggingly literal US one (Redemption; do you reckon that could be what it’s about? Perhaps you should announce it on the poster just in case there’s any possibility of doubt)? The French title’s the best one for ignoring the tone of the picture, though; Crazy Joe indeed! If Stat’s traumas are sketched in broad strokes, the women in his life are even more so; hookers and nuns. His mission is to dispense justice on the man who murdered his homeless friend, and he’s aided and abetted by a soup kitchen nun (Agata Buzek) with her own traumatic past (unfortunately the flashback to how Cristina deals with her problem has that reek of movie implausibility and so pulls the rug from under any impact it might have). Joey and Cristina have a romance so unlikely, you become convinced Knight is purposefully baiting his critics to call foul. And while it never for a moment convinces, not helped by some atrocious dialogue, there’s good chemistry between Stat and Buzek. We also find Stat playing to his gay fan base; he falls into an empty flat decorated with rippling man flesh and pretends he’s its occupant’s (Danny Webb) boyfriend. While it’s good fun to see the Stat as the underdog regaining his stride - he does a work out montage, attacks some heavies with a spoon, and then goes to work for the Chinese mob – Knight allows it all to come to him much to easily. He has a flat, a car, a credit card, waiting in the post and a wardrobe filled with perfectly fitting suits (and a very jaunty cap). As usual, Stat in action is a lot of fun, taking down a gang of footie fans and then attacking with that spoon the duo who set on him in the opening scene. Knight broaches ideas of moral equivalency clumsily, using Cristina as a nagging conscience. Joey is willing not just to go into moral grey areas to track down his prey; he plunges into darkness. But the picture never does anything with the idea that his participating in human trafficking is a justifiable sacrifice in service of his cause. The resounding box office failure of Hummingbird doesn’t seem to have dented the careers of either the Stat or Knight. The former remains a safe bet as long as they keep the budget down or stick him in an ensemble franchise (as Lee Christmas, or in Fast & Furious); he’s been a draw for more than a decade now, and he’s generally reliable no-brainer entertainment value. Knight is on a roll, with the success of Peaky Blinders on the small screen and a rash of screenplays coming up for the big. He’s also had time for his sophomore directing gig, Locke with Tom Hardy. In the case of Hummingbird, aided by old hand cinematographer Chris Menges, Knight at least doesn’t disgrace himself. Perhaps given time he can truly impress.